Greeks are not only hospital people, they also have plenty of good wishes for you: kali mera (good day), kali apojevma (good late afternoon), kalo vradi (good evening), kali nichta (good night) and those are only wishes for a day. On Monday they also wish you a kalo efdomada (good week), and on the first of every month a kalo mina (good month). At the end of the summer, when the sea is still warm and temperatures are around 30ºC, they start wishing you a kalo chimona (good winter) and it won’t take long before they start saying kalo Christojenna (Happy Christmas). At midwinter they start again, wishing you a kalo kalo kero (good summer). Summer cannot start quickly enough. Strangely, NOBODY HAS EVER WISHED ME a good autumn (kalo ftinopero). I love the seasons. I could never go and live in tropical country where there is no clear differentiation of the seasons. When autumn comes I love to see the beautiful fading light, the warm sea, the changing colour of the leaves and especially the typical aroma of autumn: a combination of dying figs and grapes, humid earth and the sweet smell of quinces. In summer I long for the open fire, in winter the burning sun and the cooling water of the sea. But it is good that after autumn comes winter, maybe with some snow, always in front of the fire. Then, just when you have had enough of the cold, spring announces itself. My favorite seasons are autumn and spring. And I am lucky because here in Greece these seasons can stretch for months. You can say that ripe figs at the end of August are the first signs of autumn. Then it depends on the weather when autumn really starts. Cold, rain, mushrooms, snails, these can occur at the end of September, or not until November. 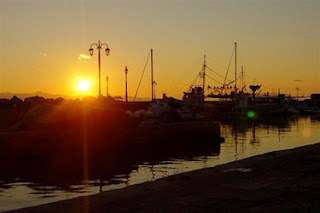 And the Greeks say that real winter only starts in February, so you can see how long an autumn can last here on Lesvos. For spring it’s the same story. The first signs of spring are the purple anemones that carefully open their petals in December. And when according to the Greeks it is real winter there are plenty of anemones, together with other spring flowers and blossoms. We got the dark seasons – autumn and winter — thanks to Demeter the Goddess of the harvest and cereals. Her daughter Persephone was abducted by the god of the underworld, Hades, and disappeared into the kingdom of Death. Ilios (the sun) saw that happening and warned Demeter who immediately took off to Hades to ask for her daughter to be returned. But Hades was clever. He already had offered some of those beautiful red seeds of the pomegranate to her. Persephone could not resist eating a few of them, thus signing her own fate: anyone who ate something in the Underworld had to stay there forever. This is how Persephone married Hades and why Demeter had so much sorrow that nothing grew on the earth anymore. Would the Gods rule a world where nothing grew? Zeus, who actually helped Hades to abduct Persephone, intervened: Persephone would stay one month in the Underworld for each seed of the pomegranate she ate. In different versions of this story the number of seeds Persephone ate varies. So you can’t be sure just how many months she had to stay in the Underworld or how long Demeter had to cry and not let anything grow on earth. So the months can be anything from two to seven. If Persephone only ate two pomegranate seeds, then we would have two months with no growth or flowers. Well, Demeter must be a modern Greek politician - getting bribed - because what I really like about Greece especially here on Lesvos is that in each month there is always something growing: in October quinces and pomegranates are ripe and the strawberry trees are full of fruit; by November chestnuts and olives are ready to be harvested (the olive harvest can last until in February); in December anemones start to flower and you can find plenty of mushrooms. They are there as soon as the first rains fall after the end of summer. In January the first almond blossoms appear, and oranges, lemons and mandarins will be ripe; in February many other trees blossom and in the first months of the year many wild vegetables will slowly start showing their bright green leaves. In March you can go crazy amongst all the spring flowers (some of them edible) and wild asparagus shoots turn their heads towards heaven. So how can you say nature is ‘dead’ in the dark months of winter? The winter fields here are full of all kinds of cabbages, salads, spinach, carrots. There are no empty fields and harvesting goes on all year through. I think that Persephone must have divorced Hades before staying too long in the Underworld, otherwise her mother Demeter must have offered a bribe in one of those famous envelopes used by the Greeks to settle everything. After a super post-summer season, the weather forecast now predicts true autumnal temperatures and hopefully the plants will get some water. The soft pink evening light suggests humidity in the air and one of my favorite seasons now starts: kalo ftinopero!